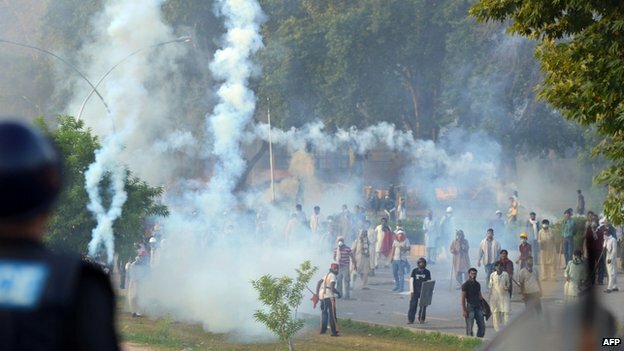 JNN 01 Sept 2014 Islamabad : Pakistan Police Heavily baton charged and fired thousands of tear gas Canniisters at Anti-Government Protesters Trying to stage a Protest Sit In Infront of the official Islamabad residence of Prime Minister Nawaz Sharif. At least three people were killed and nearly 500 admitted to hospitals in clashes that started Saturday night and continued to boil over Sunday, officials said. They want Mr Sharif to resign, alleging Uncontrollable corruption , Nepotism and Heavy Electoral fraud. Anti-government Protesters repeatedly Clashed with Police Sunday in the Pakistani capital, and the Top Military Brass Cautioned the Prime minister against further use of force in the crisis that has triggered the biggest challenge yet to his authority. The 73 Days Long Episode , in which on 17 June 2014 , Atleast 14 People were Killed and More than 100 were injured By the Live Bullets fired By the Punjab Police on the orders of the Chief Minister Shahbaz Shariff & with the consent of Prime Minister Nawaz Shariff , when the Police Brutally Cracked Down on Unarmed Peaceful Protesters who were just trying to resist the Illegal act of the Punjab Police who were trying to remove the Security Barriers , which were erected on the Orders of Lahore High Court , Keeping in view the Fragile Law & Order Situation of the Country . After Which the top Leadership of Pakistan Awami Tehreek Led By Allama Tahir ul Qadri Ran Pillar to Post to have their FIR Registered against the Culprits ,who Killed 14 Innocent People including a Pregnant Woman , who were Unarmed and Peaceful ,the TV Footages of the event are also available , which also verify their claims , but the Dictatorial Attitude and Style of Nawaz Shariff Led PML – N Government Instead Registered an FIR against the families of the Martyrs and the Leadership of the Pakistan Awami Tehreek who were the victims of the Brutal Aggression . After failing all the efforts and the grievances un addressed , a call for a Long March from Lahore to the Capital of Pakistan Islamabad was Given , which started on the 14th Aug 2014 , and reached Islamabad , and staged a Protest Sit In in the D Chowk Area , Near the Parliament House Building of Pakistan . At the same time Another similar Protest and a Long March call was given by another Political Party , Pakistan Tehreek e Insaaf led By the former Cricket Captain Imran Khan who heads also the 2nd Largest Party in the National Assembly , and also Have formed their Govt in the KPK Provincial Assembly . Subsequently Both the Marches started Simultaneously from Lahore , and Staged their Protest Sit Ins in Islamabad , Side by Side . The demonstrations were 100% Peaceful until late Saturday, when protesters headed toward the Prime minister’s residence. When the crowd started removing shipping containers used as barricades, police fired Barrages of tear gas that forced protesters back , which created Chaos and Panic among the Marching Protesters , which included Women , Children and even toddlers accompanying their Mothers . And Due to which a Heavy casualty was witnessed, as More than 500 Men , Women and Children were injured , as at the same time the Police even Heavily Baton Charged the Protesters , Without any Discrimination of Women and Children , and in the same Process the Police even Brutally Baton Charged the Press and Media Teams of Different Media Groups Present at the scene covering the Story. The Demands of Both the Parties is that the Actual FIR , in which all the Culprits Involved in the Incident of the 17th June at Lahore , in which 14 Men including a Pregnant Women was Killed by the Police firing should be registered , including the Chief Minister of Punjab , the Prime Minister Nawaz and the all the People with whose consent the Incident occurred . At the same time there Demands Include the Removal of the Prime Minister Nawaz Shariff and his Younger Brother Shahbaz Shariff from their Posts , So a Unbiased and Non-Controversial Inquiry can be Conducted . The Other Demands of the Parties is that a Non Partisan Judicial Commision should also be formed which can also Probe the Heavy Frauds and Rigging in the Previous Elections , Due to Which the Present Parliament has come into Existence . And if their allegations are found to be True by the Commision, it should also declare the previous Election Void , So a New Election should be conducted . But Before Conducting the New Elections , A New Non Politicized , Honest and Unbiased Election Commission should be formed , which can conduct the Upcoming Elections. At the same time The Govt should take steps that the Corruption, Nepotism and Other ills of the System can be weaned Out, and the Much Needed Judicial Reforms , Elections Reform , Local Bodies Sytem should be implemented in its true letter and spirit . So the Nation can Prosper and the Results of the Growth of the Nation , can trickle down till the Bottom , so the Poor and the Lower class can also Benefits from the Benefits of the Revolution , for which they have taken up the Stand. But the Major Problem is that as the Pakistani Political System is Heavily under the Influence of the US , and which does not want that all the corruption and such ills of the society should be eradicated , as it Benefit them in Planting and Buying out their Agents in the Country . and they are Opposing the change in system, Under the Banner of Democracy , and Due to which the Political Parties of Pakistan , which are covertly working in the Best Interest of the US and their Policies are against the Removal of Prime Minister , as they are of the Belief that if this system is shaken or completely eradicated , then there will be Place for them in the Power Corridors , with which they can enjoy the Benefits and Perks, under the Banner of Democracy and Liberalism , which is the Slogan of the US and the West. And in return the US and West would also not be able to Dictate their Policies to the Sitting Govt , whether it is formed of the Leftist or the Rightist Parties . “Further use of force will only aggravate the problem,” military leaders said in a statement that called on political figures to resolve their differences swiftly and peacefully. Hundreds of people were arrested, said Islamabad Police Chief Khalid Khattak. There were scattered clashes Sunday morning, and protesters appeared to regroup later in the afternoon. By evening, large groups of protesters were located in pockets around the parliament and some had spread into other parts of the city, said police official Amir Paracha. The injured included women, children and journalists who had been hurt by tear gas shells, batons and rubber bullets, said Dr. Javed Akram, who heads the capital’s main hospital. Both Khan and Qadri, who spent most of the day inside the shipping containers Turned into Caravans that they have been living in for days, addressed their supporters in impassioned speeches. Both Khan and Qadri called on more people to come into the streets to support them. There were some apparent cracks in the Govt , as about 800 Police Men Posted in the Islamabad for the Crack down on the Protesters Refuse to do so and left their Positions and headed towards their Homes , while about 3 Senior Police Official also refused to so , and even refused to take charge as the SSP Police . Sharif vowed Saturday that he would not step down, but if the violence continues, it could severely undermine his authority. The Protest and Sit Ins by the PTI , MWM , PAT , SIC workers has now also started in other cities of Pakistan , and among them the Major Protest Sit Ins were Witnessed in the Business Hub of the Country Karachi, where Sit Ins were Performed at More than 4 Places , choking the Main arteries of the city . And if a quick solution is not taken out and steps are not taken , then the Protest may spread in every District of the country , Bringing the country to a stand still , Due to the arrogance and ego of a Single Man , which is at the helm of affairs at the Moment. This entry was posted in Asia Pacific, Pakistan News and tagged Chief Minister Shahbaz Shariff, Islamabad, pakistan, Pakistan Awami Tehreek, Pakistan Tehreek e Insaaf, Parliament House, prime minister nawaz, prime minister nawaz sharif, Prime Minister Nawaz Shariff, Protest Sit in, Protesters. Bookmark the permalink. ← SECRET INVESTIGATION REPORT : Nawaz Shariff Led PML N Promoting Yellow Journalism to Retain their Corrupt Govt.